Keeley Haftner made national headlines this week when an outraged Saskatoon resident vandalized her publicly funded art installation Found Compressions One and Two. The installation, which consists of two shrink-wrapped bails of recyclable materials, was inspired by Haftner’s time working as a sort-liner at the city’s local recycling plant. Now draped in a black tarp and bearing a sign that states, “Our tax dollars are for keeping garbage OFF the streets”, the installation has started a dialogue about waste and art in public spaces. AZ: Let’s start by briefly discussing Found Compressions One and Two. What does the art installation depict and how did the project come about? KH: The work consists of two bales of compressed plastic: one mixed (or #3 through 7 plastics), the other film (saran wrap, plastic bags, packaging, etc.). They are wrapped in cellophane as they would be for transport, and stacked one on top of the other. There was a sign (now gone, having been damaged) that gave the title and description for the work, my email, a link and scan code for the accompanying blog, and my website. I considered the blog to be an integral part of the work. It was host to a series of interviews I did with Loraas employees, the facility where I sourced the bales. These employees work on the sort line sorting these and other plastics, as well as other recyclables like cardboard, metals, paper and beverages. The project came out of my employment with Loraas, which I did as both income and research for future projects. While employed there for about six months, I was permitted to photograph around the facility and ask gads of questions about operations. I quickly learned that recycled plastic has a hierarchy, which fascinated me. The whole line is engineered to facilitate collecting what’s worth most, beginning with #2 Naturals (milk jugs), then down to the catchall, #3-7. With my keen interest in society’s structures for valuation, especially in reference to refuse, I was immediately drawn to these hard-to-sell plastics. Within the facility the cubes upon cubes of recyclables, all sorted and stacked to dizzying depths and heights while awaiting purchase and distribution, were incredibly satisfying. It would be more than a year after my sort-liner experience that I would conceive of Found Compressions One and Two after having made a number of different projects of a similar vein, including Waste Warrior Eats Apple and Transgenic Tree. I had originally envisioned these bales encased in a clear resin, in a manner akin to the work of Rachel Whiteread, so that they would become a permanent and seductive monument. As I continued to consider both the logistics and the significance of dealing with the material this way, I soon conceived of the work differently, as I felt, more effectively. As an unmanipulated object the work related to a number of art historical precedents, and had the added benefit of being temporary and open to repurpose. The historical work to which I primarily refer is that of César Baldaccini, a new realist sculptor whose series of ‘compressions’ were comprised of scrap metal, crushed into cubes with colouristic relationships. 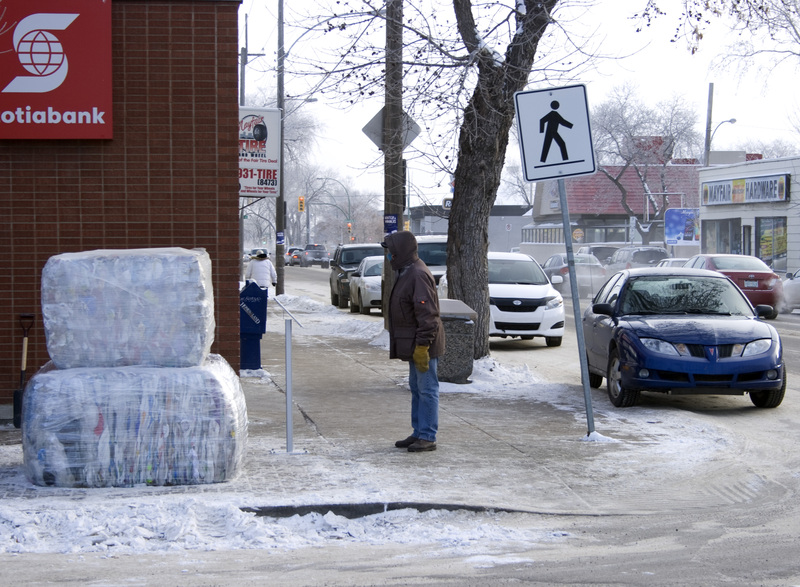 The notion of having a compression ‘ready-made’ by the city of Saskatoon seemed both site-specific and evocative, and in a way, also collaborative. When I saw the opportunity to apply for the Placemaker program, I honed these ideas and submitted to produce the work. AZ: Having waste in public spaces is, in many ways, the opposite of how most Canadians experience waste. Is there a specific dialogue that you were hoping to start about waste and recycling? How have people reacted to the piece? 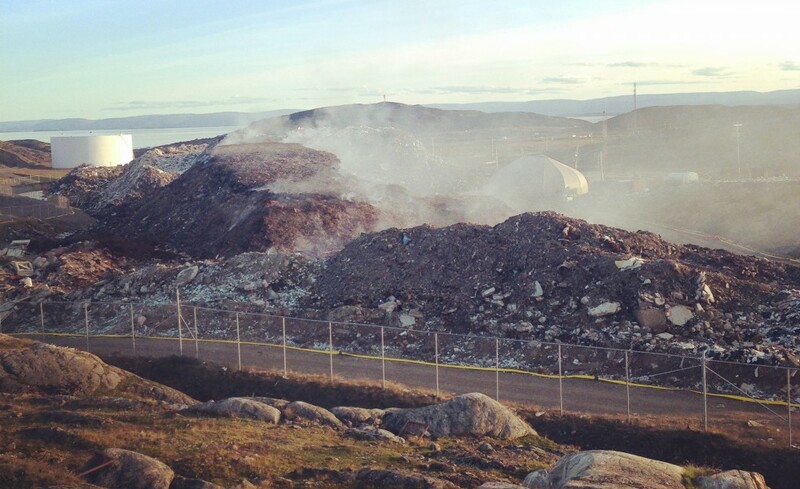 KH: In Canada we are both privileged and deceived to have our waste taken care of in such an invisible manner. I spent a few weeks in Tanzania as a youth and what was perhaps most deeply impressed upon me was how waste was managed in a country with next to no infrastructure to manage it. By comparison to our habits, so very little waste is produced there, and yet so much is visibly accrued with no one to whisk it away. If you throw something in a public wastebasket, it piles up until spilling over. There were fields and fields of garbage, and our African companions just threw their trash out the window. And of course they did; where else should it go? Now they’re one of first countries to actually bar the importation of many products containing packaging that they’re not equipped to deal with. This legislative management of reduction is far more progressive than recycling, the lesser of the three Rs. They’re far ahead of us on that front. Back to Saskatoon: in 2013 we were the last major city in Canada to implement a city-wide recycling program, and when we did, I witnessed people chucking their bins on their lawns in protest of having to put the same waste in one bin over another. Such an effort! I know so many people who still throw Tide jugs in the garbage and refuse to simply rinse a container so that it can be recycled. I think that Canadians and Americans in particular are horrified to see the results of their epic consumption placed in front of them. What is perhaps more ghastly still is to imagine that these byproducts could be culturally valuable, as we’ve seen with the reaction toward this project. In many ways Found Compressions is actually a portrait of the city that is both time and media specific. The things that we own and produce are not always beautiful, and in my mind the best art does not function as decoration. I did hope to garner a discussion around all of these interests, but also on the value of public art within our city. There is a pejorative term– so-called ‘plop’ art – for public art that is dropped on site without consideration to its context or surroundings. It is work could be located anywhere to the same effect. Much of the work in Saskatoon could be said to be of this nature. Found Compressions hovers in a weird grey area between site-specific and without context, monument and temporary, interactive and static. And it has literally been ‘plopped’ on site. In this way it questions its own existence and the existence of the works around it. There can be no doubt that people have reacted strongly, and in many cases negatively, to this work. Many community members within Mayfair have taken the work as a direct reflection on the challenges of their community, feeling that they were ‘given garbage’. This goes back to the discussion of site – how an artwork is situated within place and what context means for it. There are parts of this conversation that would have been prompted no matter where the work was located, but that are further compounded and complicated on 33rd. It is an opportunity to discuss the direction of the area, issues of gentrification, the function of public art and a community’s ownership of it. Mayfair received some rather traditionally ‘beautiful’ public works as well – a bronze sculpture and a painted mural – but they also got an incredibly provocative piece of contemporary art, which is also incredibly temporary. I believe that these works absolutely fulfill Placemaker’s mandate to enhance civic spaces. AZ: You’ve referred to the “vandalism” of Found Compressions as a “new iteration” of the project. Can you explain what you mean? KH: When a work is placed in the public belongs to the public. This ownership includes but is not limited to the artist. At this stage in its existence it is susceptible to time and change, reaction and interaction. A work that has itself all sorted out before its execution is stagnant. “Once anything is understood, it is surrounded by generalities and it has no life”, artist Robert Rauschenberg once aptly stated. Art can have the capacity to react to and reflect those interacting with it. In the case of the ‘irate taxpayer’, his reaction was a reflection on the very discussion that I had hoped to prompt. Whether consciously or no, the black tarp that was draped over the work resembled a garbage bag. These nearly valueless plastics that exist in a strange space of made (they are containers, shrink wrap, chip trays) and not yet made (they are a raw material waiting to become something) were proclaimed to be valueless. I believe garbage is another term for ill-considered. That very lapse in terminology (recyclables versus garbage, art versus junk) is at the root of this discussion. In a way the public is remaking the work through this discussion, just as it was remade through its difficult journey through the winter. It showed up on site pristinely wrapped, pearlized and hinting at its contents, not giving too much away and seeming rather inoffensive. But like the traces of waste that accumulate under pretty snow throughout the winter that are then revealed during our unsightly, honest spring, this process has altered our sentiments about what this artwork is. It will again be remade when it is returned to Loraas after it is uninstalled, as a sort of ‘closed loop’ sculpture. I think of artist Niki de Saint Phalle who once said “there is not such a great difference between construction and deconstruction.” I believe this to be true. AZ: Your blog states that you spent several months at the local recycling centre before coming up with Found Compressions. How did your experiences there inform your piece? Does this relate to your decision to include interviews with recycling workers? KH: As a sort-liner I was struck by the grueling nature of the job. There was an incredible sense of pride in the work – I boast of a record of over 130 picks per minute that still precedes me at the plant – but it is an incredibly physical, human process. I did the interviews to accompany the work because I had hoped that this would reveal some small part of this invisible labour. I’m not sure how most people envision the process of recycling, if they indeed think of it at all, but aside from the advent and recent installation of a new ultra violet pre-sort mechanism, and ‘stars’ and magnets that are able to strain out a certain amount of specific recyclables, almost all of these materials are picked and sorted by human hands. The majority of these workers in Saskatoon are from Sudan, and the turnover on the sort line is considerable. When things like dirty diapers tossed in blue bins by inconsiderate parents, lunch leftovers from those too lazy to find a black bin, or even, frighteningly, needles are put in with recyclables, they must be removed by these workers’ hands. The blog contains anecdotes and stories from these workers regarding some of the most interesting and dangerous things they’ve come across on the job. It tells of where they’re from and why they’re there. The employees of Loraas are part of the narrative of this work. As scholar and activist Silvia Federici states, “only from a capitalist view point being productive is a moral virtue, if not a moral imperative. From the view-point of the working class being productive simply means being exploited.” These workers and myself were paid and treated well, but we are responsible for the aftermath of the promotion of unending production and planned obsolescence. It is a unique and important perspective. AZ: Found Compressions is an interesting interplay of politics, industry, media, art, and science. How do these topics inform your art? How does this relate to your decision to create a waste-based art installation? KH: My practice is in the early stages of its development, but merging these aforementioned categories in the production of meaningful and worthwhile art has been a primary focus of mine. It’s a challenging fusion. There are those within art who feel that activism is misplaced there, and others who think that politics and an artist’s role as a citizen are inextricable from their work. Science and art have often been posited as either parallel or estranged. My husband is a PhD toxicology candidate and we find many of our interests to be complimentary and mutually affective. We have worked together on projects and hope to continue to do so. It’s difficult to fuse all of these diverse and at times competing interests into an art practice, but there are many contemporary artists who are doing it well. And many who are doing it poorly. I’m not sure where I fit on the spectrum yet, but I hope as I continue to make, read about, think about, and look at art, that my practice will develop to a more effective amalgamation of these considerations. Perhaps what I would deem the biggest failing of this work is its persistent need of defense. As critic and philosopher Theodor Adorno has said, “the less works have to proclaim… the more telling they become in their own right, and the less they need a surplus of meaning beyond what they are.” Although this ‘defense’ and explanation process has fueled more debate and discussion, it is my hope that my future work will do a better job of speaking for itself. Keeley Haftner is a locally-based Saskatonian artist whose practice is developing in the context of investigating value-based hierarchies. She will be pursuing her Master of Fine Arts at the School of the Art Institute of Chicago in the fall of 2014. Alex Zahara is a Master of Environmental Studies candidate at Queen’s University in Kingston, Ontario and a member of the Canada’s Waste Flow research team. He is interested in studying the role of waste in colonialism and structural violence.